Research is underway at Rochester Institute of Technology that will give scientists a better understanding of the vitreous humor, or gel, that fills the eye and could lead to advances in the treatment of vision disorders, drug delivery and eye surgery. 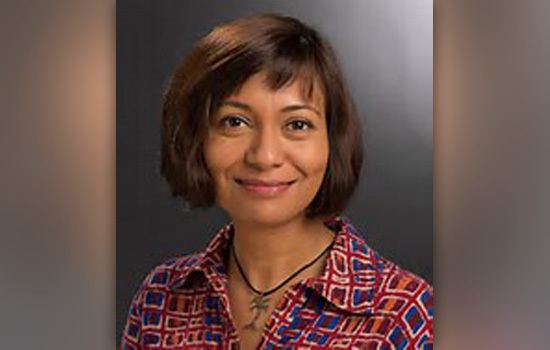 RIT biophysicist Moumita Das is leading a National Science Foundation-funded study to explore properties critical to the function of the vitreous and the eye. Her team is investigating changes in the vitreous gel on structural and mechanical levels that result in vision impairment. “We want to connect changes in the structure in the vitreous to changes in mechanical and thermodynamic properties to changes in function,” said Das, an assistant professor in RIT’s School of Physics and Astronomy. Vitreous gel consists mostly of stiff collagen fibers, soft polysaccharide chains and a watery solution. The effects of disease and aging cause the gel to become progressively more fluid like and detach from the retina. Tiny vitreous shadows or “floaters” can lead to more severe macular holes and retinal detachments. Das’ team will use experimental and theoretical methods to investigate the biophysical origin of vitreous-related pathologies. The RIT team includes Scott Franklin and George Thurston, professors in the School of Physics and Astronomy, and David Ross, professor in the School of Mathematical Sciences.